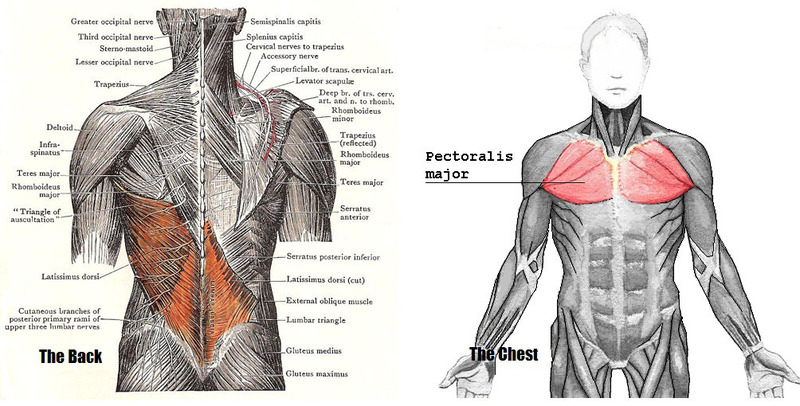 The abdominal head of the pectoralis major muscle is one of three origins for the pectoralis major. It arises from the fascia of the external oblique muscle. Broadly, pectoral is a term relating to the chest, and the pectoralis major is a large, fan-shaped muscle that covers much of the front upper chest. It begins at the breastbone (sternum) and the cartilage of the second to the sixth ribs and is attached to the collarbone (clavicle) to converge on the upper arm bone (humerus) just below the shoulder. Its main use is in moving the arm across the body. 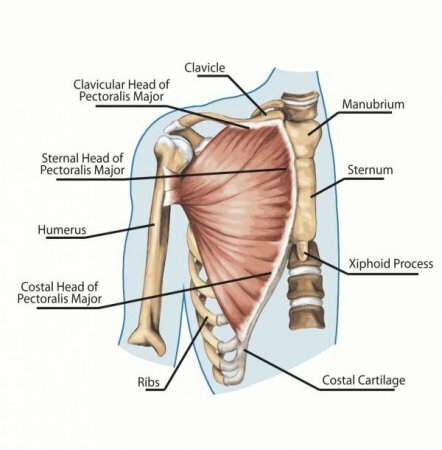 The clavicular head of pectoralis major muscle is one of three origins for the pectoralis major. It arises from the clavicle (towards the sternum) and is critical in flexion and rotation of the humerus bone. Broadly, pectoral is a term relating to the chest, and the pectoralis major is a large, fan-shaped muscle that covers much of the front upper chest. It begins at the breastbone (sternum) and the cartilage of the second to the sixth ribs and is attached to the collarbone (clavicle) to converge on the upper arm bone (humerus) just below the shoulder. Its main use is in moving the arm across the body. 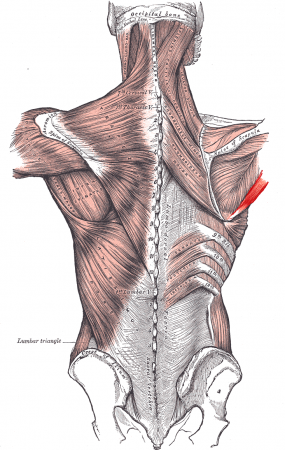 The infraspinatus muscle is one of the rotator cuff muscles. The stability of the shoulder joint is mainly provided by the tendons of the subscapularis, teres minor, infraspinatous, and supraspinatous muscles that together form the rotator cuff. The cuff is fused to the underlying joint capsule except inferiorly. Because of the lack of inferior stability, most dislocations or subluxations occur in this direction. The shoulder is most vulnerable when fully abducted and a force from a superior origin is applied. 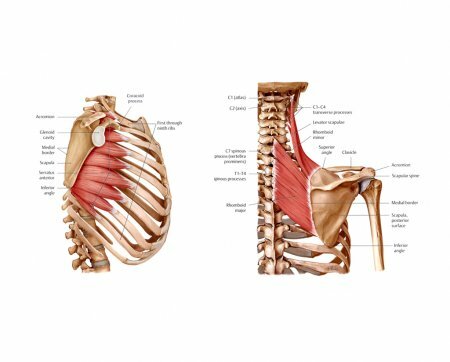 The latissimus dorsi muscle has its origins along the lumbodorsal fascia of the lower back, arising from the inferior thoracic and lumbar vertebrae, sacrum, iliac crest, and the four most inferior ribs. From its many widespread origins, it runs obliquely, superiorly and laterally through the back and armpits to insert on the posterior side of the humerus of the upper arm. As the latissimus dorsi approaches its insertion point, the many muscular fibers from its many origins merge to a point, giving the muscle a triangular shape. 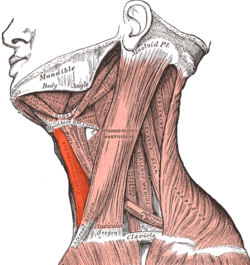 The levator scapulae muscle resides at that back and side of the neck. Levator means to lift in Latin, so as the name implies, its goal is to lift the scapula. It comes up by tendinous slips from the transverse processes of the atlas and axis and from the posterior tubercles of the transverse processes of the third and fourth cervical vertebrae. It is embedded into the vertebral border of the scapula, amid the medial angle and the triangle smooth surface at the root of the spine. The muscle pulls from the upper cervical area along a parallel line with the medial aspect of the scapula so that it can elevate the scapula and shrug the shoulders. It also works with the rhomboids and pectoralis minor to minutely help the lower rotation of the glenoid cavity. In addition, the levator scapulae muscle laterally flexes the neck to the side when the scapula is fixed. The other scapula muscles will work with the levator scapulae to secure the scapula and its corresponding glenoid cavity to strengthen how efficiently and effectively the muscles work in the shoulder joint. The sternocleidomastoid covers the superior portion of the levator scapula and the trapezius covers the inferior part. 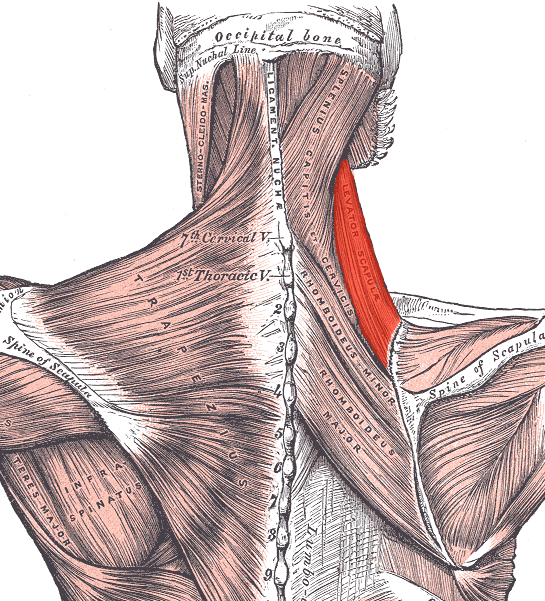 The scalenus medius binds the levator scapulae in front and the splenius cervicis in back. In the middle of the levator scapulae, the spinal accessory nerve flows laterally and the dorsal scapular nerve may rest much lower to go through it. The levator scapulae are served by two or three branches of the fourth and fifth cervical nerves and often by a dorsal scapular branch. The serratus anterior muscle is a broad, curved muscle located on the side of the chest. It functions to pull the scapula (shoulder blade) down and to the front, and is used to thrust the shoulder forward as when pushing something. The sternocostal head of the pectoralis major muscle is one of three origins for the pectoralis major. It arises from the sternum and creates adduction in its insertion with the humerus bone. 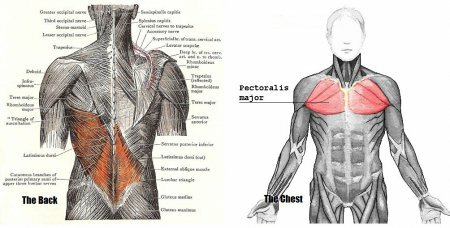 Broadly, “pectoral” is a term relating to the chest, and the pectoralis major is a large, fan-shaped muscle that covers much of the front upper chest. It begins at the breastbone (sternum) and the cartilage of the second to the sixth ribs and is attached to the collarbone (clavicle) to converge on the upper arm bone (humerus) just below the shoulder. Its main use is in moving the arm across the body. The sternohyoid (sternohipideus) muscle depresses the hyoid bone. The teres major muscle is a thick, flattened muscle that brings the arm toward the body and assists in extending it when the arm is in a flexed position. There are two teres muscles. The other one is the teres minor muscle, which rotates the arm laterally and assists in bringing it toward the body. As it draws the upper arm bone (humerus) up, it strengthens the shoulder joint. 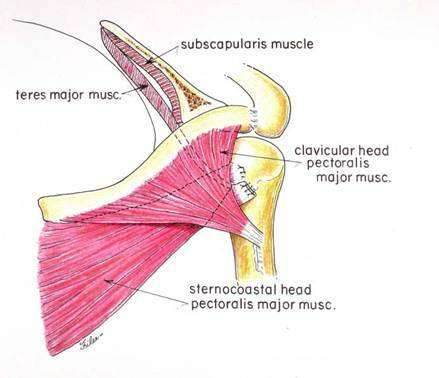 The teres major muscle also aids in rotating the arm but its function is just the opposite of the teres minor and other muscles in the rotator cuff. 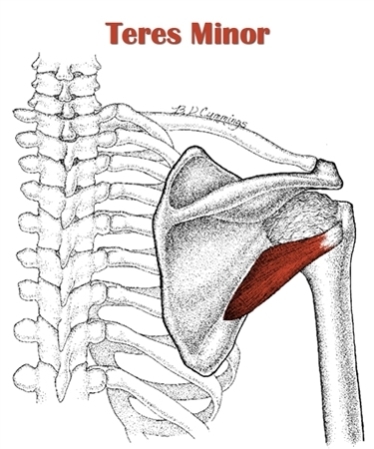 The teres minor muscle rotates the arm laterally and assists in bringing it toward the body. As it draws the upper arm bone (humerus) up, it strengthens the shoulder joint. There are two teres muscles. The other one is the teres major muscle, a thick, flattened muscle that brings the arm toward the body and assists in extending it when the arm is in a flexed position. 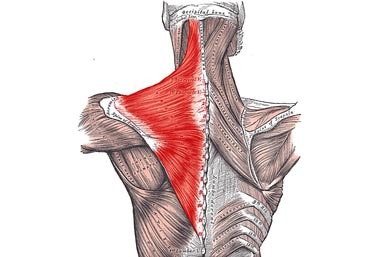 The teres major muscle also aids in rotating the arm but its function is just the opposite of the teres minor and other muscles in the rotator cuff. The trapezius arises from ligaments at its origins along the nuchal crest of the occipital bone and the spinous processes of the cervical and thoracic vertebrae. It extends across the neck and back to insert via tendons on the clavicle, acromion, and spine of the scapula. The name trapezius is given to this muscle due to its roughly trapezoidal shape; the long base of the trapezoid is formed at the origins along the vertebrae and the short base forms at the insertions along the scapula and clavicle. The trapezius can be divided into three bands of muscle fibers that have distinct structures and functions within the muscle. - The superior fibers cover the posterior and lateral sides of the neck with their tendons connecting to origins along the occipital bone and insertions on the clavicle. - Just below this region is the narrow band of the middle fibers, which extend from origins along the superior thoracic vertebrae and insert into the acromion process of the scapula. - Finally, the inferior fibers cover a wide region of the back from their origins along the inferior thoracic vertebrae and insert into the spine of the scapula.